Water with Ease with the One Touch Rain Wand. Allows complete and total water flow control with just one touch of your thumb. Thus eliminating the strain from squeezing as in many current watering tools. Efficiently saves water while watering from one plant to the next. Made with aluminum for a lightweight and durable feel and has rubber over mold for additional protection at the natural wear-point. 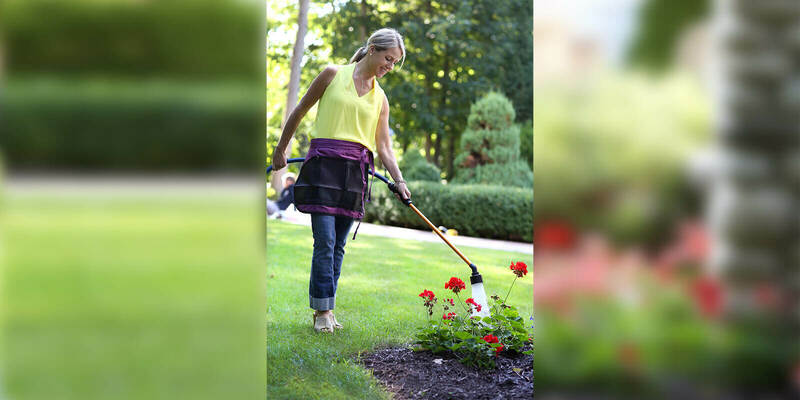 The One Touch Rain Wand is available in 16-inch lengths in red, green, blue and berry colors and 30-inch lengths in 6 enticing colors: red, orange, yellow, green, blue and berry. Lifetime guarantee to the consumer. Any of the One Touch Rain Wands can be color coordinated with Dramm’s ColorStorm Premium Rubber Hose. For watering reliability in a no frills delivery system, Dramm watering wands are the choice for The joe gardener Company, other professionals and homeowners. Recent enhancements including easy squeeze on-off valves, interchangeable heads and bright colors makes Dramm wands must-have equipment in the joe gardener testing grounds. The lifetime warranty spells quality and the wands and interchangeable flow heads deliver reliable, consistent performance every time. Proper watering is so important for plants to perform. From seeds and seedlings to shrubs and trees Dramm watering wands and heads deliver quality and consistency every time making them a repeat joe gardener Certified Best of the Must-Haves again in 2006.